The complexity inherent in HR Reporting and Analytics can be a challenge for any user without the right tools at their disposal. 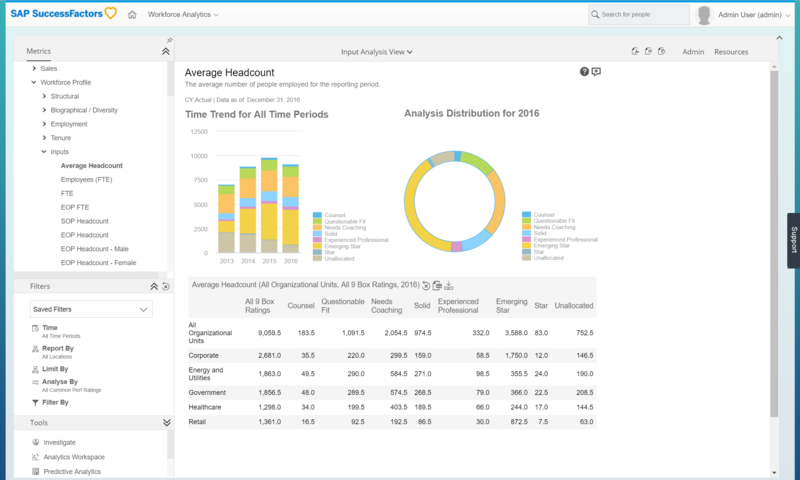 With the 2017 Q3 release comes a simplification of the entire HR Reporting and Analytics experience in the SuccessFactors suite. This post is written from the perspective of the new simplified navigation. For existing customers interested in a detailed analysis of the differences between the old and new navigation and tools you can find the Report Center Admin and User Guides on help.sap.com. These guides give a complete overview of the Report Center functionality, and contain an FAQ to better understand the changes introduced with the 2017 Q3 release. 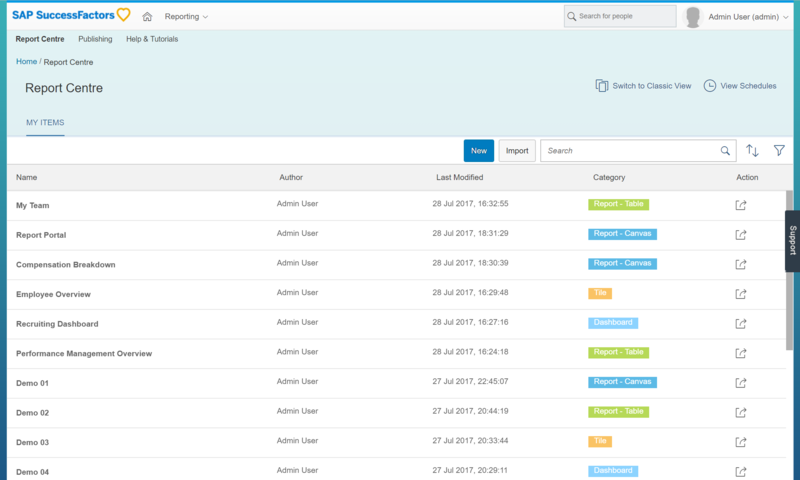 So let’s give a brief overview of the Reporting and Analytics tools available in SuccessFactors. There are three key pillars to the SuccessFactors Human Capital Analytics solution. These are Reporting, Workforce Analytics and Workforce Planning. Information from across these pillars is also embedded throughout the SuccessFactors solution, including in the Home Page and within other applications. 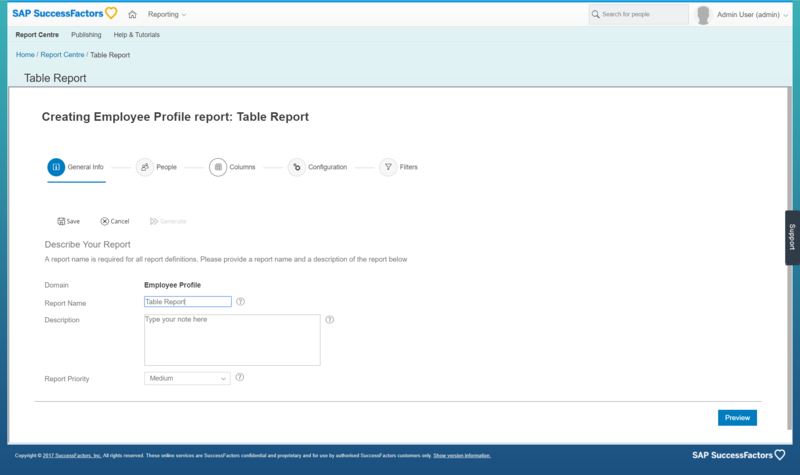 Reporting provides a set of simple templates to build formatted outputs using the data from the SuccessFactors solution, including data from the Workforce Analytics solution. All reports can be found through a simple consolidated space – the Report Center. This tool became Generally Available in the 2017 Q3 release and provides a one stop shop for all your Reporting needs, regardless of data source. Through the Report Center you can create New Reports or you can Run, Edit, Share, Import/Export, Schedule and Label existing Reports. For more information on the full extent of Report Center capabilities you can find the Report Center Admin and User Guides on help.sap.com. Reports can be built directly from the Report Center, providing several different Report formats that allow you to build reports that fit your needs. Each format provides a unique set of capabilities depending on what type of report you want to build. Canvas Reports can be used to easily drag & drop components onto a report page, these components can include Tables, Charts, Images or Text. 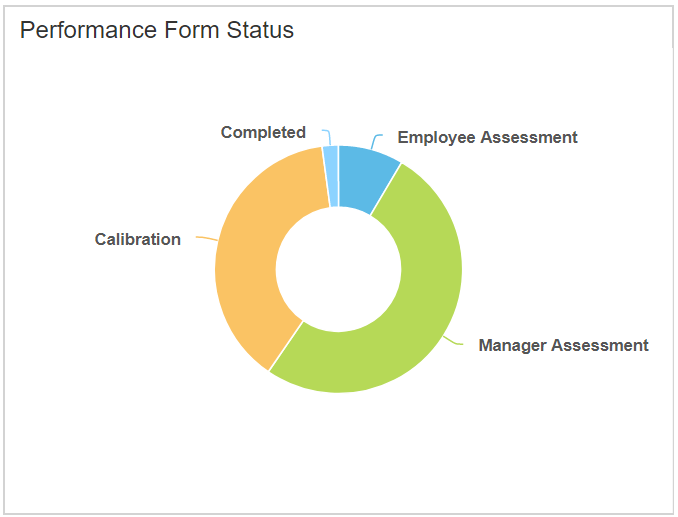 Using these components rich multi-page reports can be created showcasing data from across the SuccessFactors solution. This includes data from Live Detailed Reporting, LMS, EC Advanced Reporting, or Workforce Analytics measures & dimensions. Table Reports are designed to be extremely simple to use, allowing you to easily select data from the SuccessFactors modules and to output that in a simple table. This table can then be easily exported as required. Custom Reports provide the ability to build complex logic and layouts using BIRT (Business Intelligence and Reporting Tools). 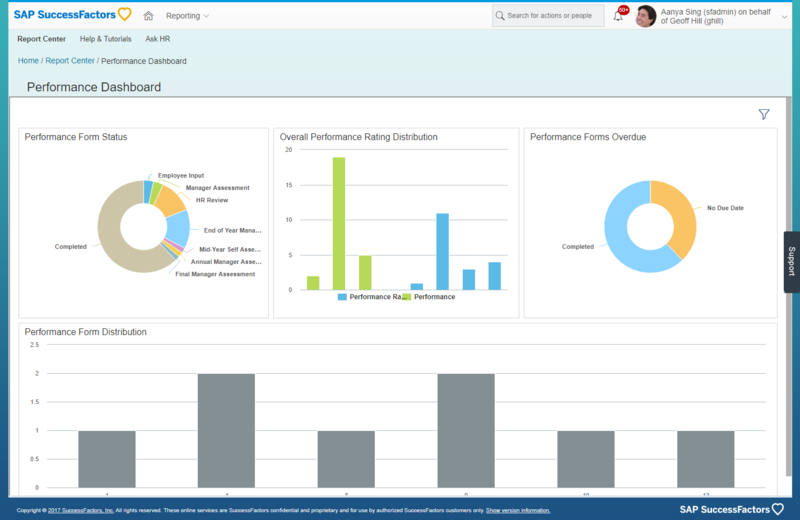 BIRT is an Open Source solution which can be embedded into SuccessFactors. This is done by uploading a BIRT template to any Table Report. The BIRT template then can apply complex logic to the data available within the Table Report, or can manipulate that data into a variety of charts and other visualisations. BIRT requires a more technical skillset than the other SuccessFactors Reporting tools, so SuccessFactors and Partners offer services to assist building these reports. 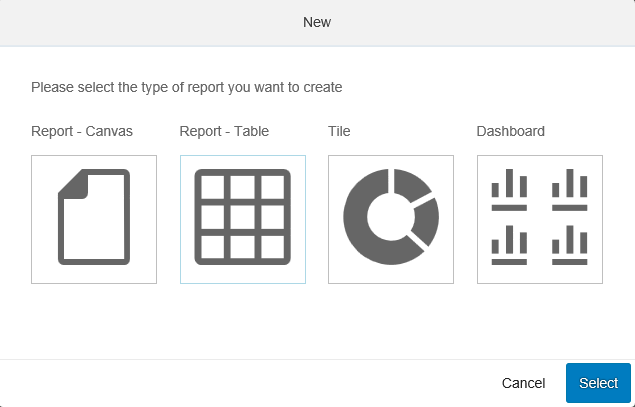 Tiles provide a simple chart output that can be embedded across the SuccessFactors suite. Tiles can be built using a Tile Builder Wizard which guides the user through the process of building a visualisation. Tiles support Drill to Detail (DtD) capabilities and DtD columns can be customised when building the Tile. Tiles can include both SuccessFactors Live data and Workforce Analytics data. 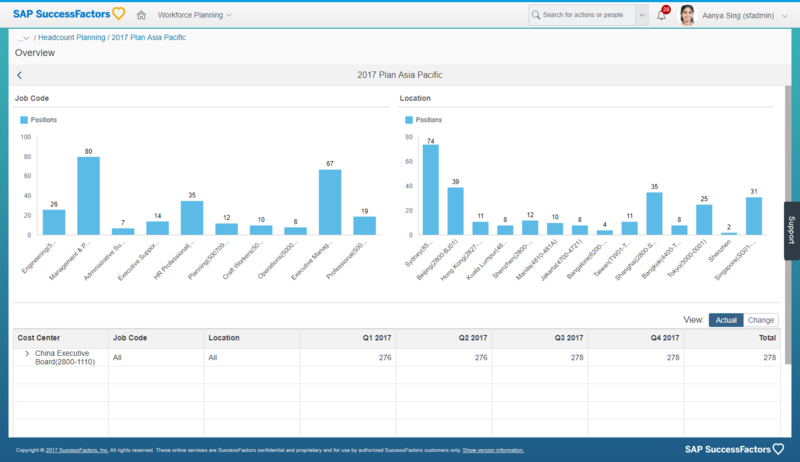 Once built these tiles can be included in a Dashboard, embedded in the Home Page or Insights Panel and can also be made available on the SuccessFactors Mobile App. Dashboards provide a method to easily collect and visualise multiple Tiles in a single place. Using Dashboards Tiles can be shown on one page, easily comparing multiple tactical metrics. 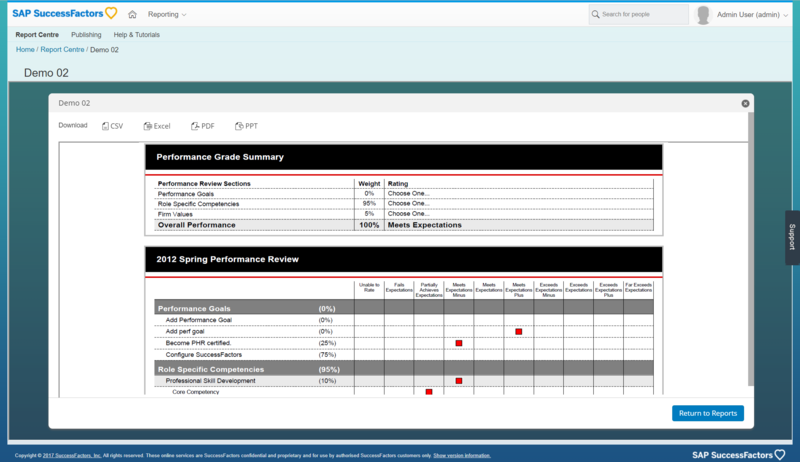 Standard Report templates are available for all core areas of the SAP SuccessFactors suite, including Performance, Goals, Succession, Recruiting, and Employee Central. These templates span a variety of Report Types and templates are being continually scoped and added. 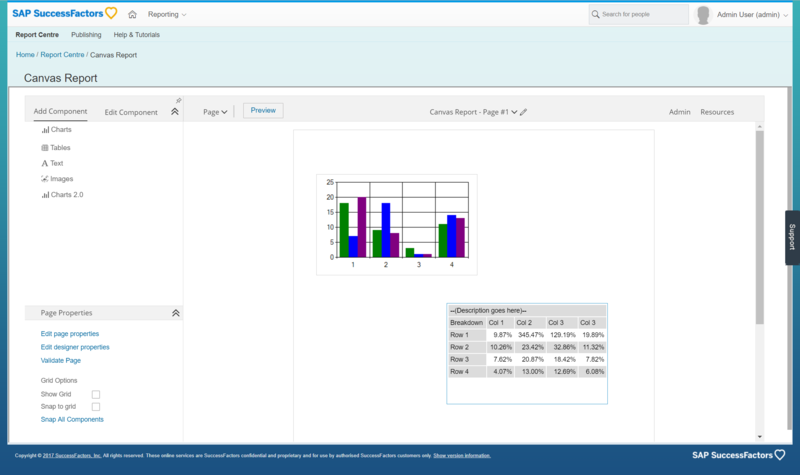 For a concise summary of all Standard Report Templates available review the SuccessFactors Analytics Reporting Directory available on help.sap.com. 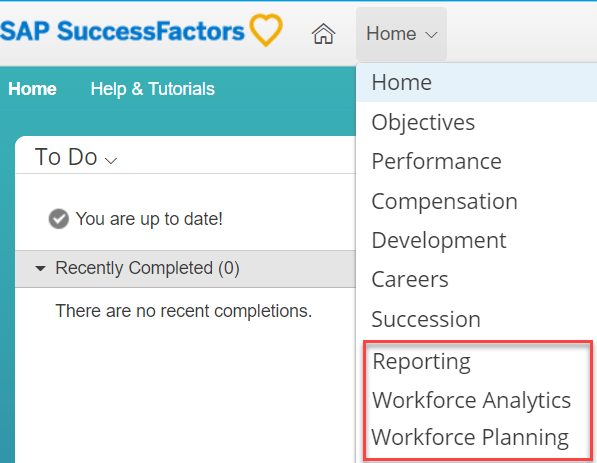 SuccessFactors Workforce Analytics (WFA) provides a single source for all workforce data, from many disparate sources. Regardless of whether those sources are from SAP, SuccessFactors or third party systems. The WFA process includes specialised Extract-Transform-Load (ETL) tasks to ensure all data is linked, and can be analysed in a relevant way. 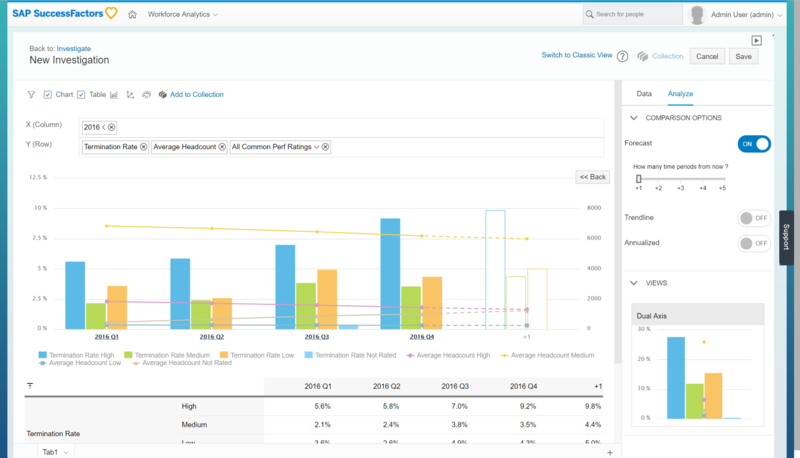 By utilising over 30 years of experience in HR analytics, SuccessFactors has developed over 2000 best practice metrics for reporting your HR data. These metrics are used across the WFA customer base, to allow for benchmarking your organisation against a similar area, location or industry. WFA comprises of the Core Workforce & Mobility metrics packs based on core HR data, with another 17 metrics packs available to add on as required. All metrics packs are designed to be intrinsically linked to get the best value out of your integrated data. Metric Pages provide a quick and easy way to navigate the rich content of over 2,000 metrics provided by Workforce Analytics. These Metric Pages allow different views of the WFA data without the need for building dedicated reports or queries. Investigate is a data exploration tool that provides capability to analyze data quickly and easily. Investigate achieves this through robust search capability partnered with recommended metrics and visualizations utilising the comprehensive WFA metric library. Analysts and HR business partners can utilise Investigate to analyse workforce issues and answer questions in less time. In addition to simple filtering, drill downs, and comparisons, you can now easily e-mail and share analysis, and gain insight from forecasting and projections, instead of just looking back at historical trends. Headlines identifies hotspots requiring managerial attention and then pushes this in common business language, stripping away obscure analytical terms ‘telling the manager precisely what they need to know’ on mobile devices, via email and the Internet. 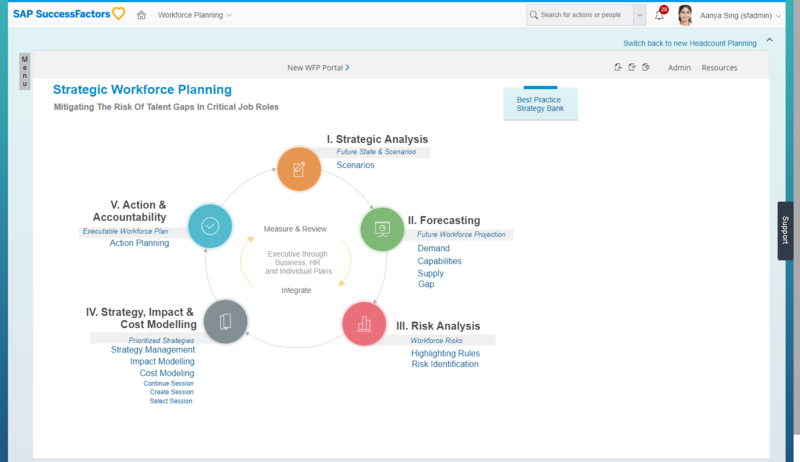 The SAP SuccessFactors Workforce Planning solution offers you a comprehensive set of capabilities that includes both strategic workforce and operational headcount planning (see Figure 1). With strategic planning, you can develop strategies that help ensure you hire and retain the right talent for years to come. Plus, with operational headcount planning, you can plan for changing organizational needs and transform this traditionally once-a-year process into an ongoing planning practice. Click here to see an overview video of Strategic Workforce Planning. Click here for an overview video of Operational Headcount Planning. So, all old menus will dissappear on Report Center right? How to see the performance and potentital tabs again then? Yes, old menus won’t be available and instead labels should be used for organisation. The performance & potential tabs are still available in the Succession module. Great blog! Crystal clear and thorough but simple… Thank you for sharing Andrew! I really welcomed the change as it makes few things simpler, though, now I have no idea how to create a query that would be served for general purposes. It is only possible to create an object (list report etc…) and then either put existing query to it or create a new query that will only be applicable for a given object. What I would want to achieve is to create more queries that would belong to “published queries” but that options seems is not available anymore. Have you any idea what to do here ? You can export a query from a List Component for re-use in other components or reports. This works in the same way as queries built pre-Report Center in the Detailed Reporting or Advanced reporting query designers. Thank you Robert! (not the most intuitive way to do it though), you guys should seriously reconsider how to document it more properly as currently there is one sentence saying it is possible. Also how do I delete those saved queries? is that possible? I can save them but how to get rid of them. As over time they will keep growing in numbers, so it makes no sense to keep them all. Will there be an option to create PIPE delimited files in the future? The Reporting center is much easier to work with than the Integration Center, but these 2 items cannot be done via reporting center and we will have to decide which one to use going forward based on these shortfalls. Thank you for the insight robert. Recently I came a across a customer who is expecting a reporting tool to have complex calculations. These are scenarios which can’t be executed unless the reporting tool has programming capabilities. Can you please advise if there are any such possibilities if customer is not using WFA and wants to use tools like advance reporting. There are many advanced capabilities in the Canvas Reports that you build with the use of Advanced Reporting. For example you can build calculated columns, or aggregated calculated columns using functions like IF/THEN/ELSE conditional statements. Ultimately the best tool for the job will depend on the specific scenario, so I would recommend doing a detailed requirements analysis of your customer’s need to best inform them of the solution that fits their use case. Generally speaking if the use case is a “top down” view (i.e. you start with aggregated data, looking at trends, and only want to drill to the detail at specific points) then tools like WFA are most appropriate. If your use case is a “bottom up” view (i.e. you are most interested in the transactional data, occasionally needing aggregates) then tools like Reporting will be best. Thank you Robert for trying to bring some clarify to what is a very confusing area of functionality. I am struggling to understand though where “Report – Custom” fits in. But after the second, you briefly mention “Report – Custom”. Is that a fifth option that only some customers have?